The craze for animatronic pets seems to grow bigger every year - and Animagic, the experts at creating these innovative toys have come up with Cassy - a cute kitten that is "hot to trot!" Designed for children aged 4 years old upwards, Cassy meows and purrs as she walks along - and with her light-up lead she's by far the coolest kitten on the block. 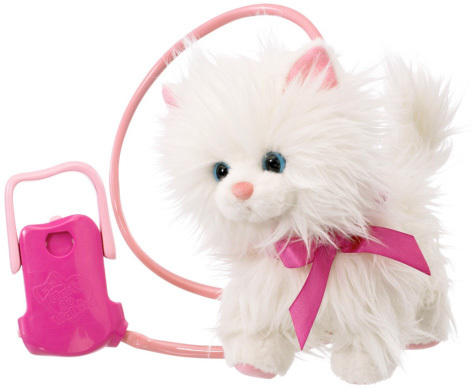 Cassy swaggers around the room like a real-life kitten, and with her sparkly lead, pink remote control and bow around her neck, she's sure to bring her owner lots of fun and good times. Please tell us what you think of Cassy Goes Catwalk by Animagic.